I have been wanting to jump on the neck scarf trend forever but honestly I just don’t know that I’m a neck scarf girl. When I saw this project for Scarf Tees in the Cricut Design Space I pushed it right to the top of my to-make list! I have been DIYing custom shirts forever with an iron, which is doable but not very effective so, last year I purchased a heatpress machine. I have really liked it but I will say it is very bulky and in a small craft space might not work. When Cricut came out with the Cricut EasyPress 2 I was super curious and last month I finally got my hands on not 1 but 2 of them! My first question was what does the EasyPress do that my heatpress machine or iron can’t? After playing with them for a few weeks now, my best way to describe it is that they combined the best features of each a heatpress and an iron and packaged it in one machine! The EasyPress has the heat capabilities and speed of a heatpress but the convenience of an iron. The EasyPress has an edge to edge heat plate that will get up to 400 degrees with totally even heating. This is the problem with making custom tees with an iron… the heat source is usually in the middle of the iron so you are not getting a consistent temperature and you end up with peeling vinyl. I had a learning curve with my heatpress and it is also pretty big. I have to store it on the floor in my craft room and it takes up a lot of real estate. If you don’t have a big workspace the EasyPress would be perfect for you because I can actually store it right on my shelf. It is also portable, which would be so fun for showers or girls nights where there is crafting involved! 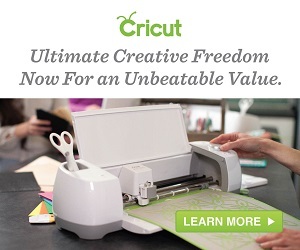 Cricut has an interactive online guide HERE that takes all of the guesswork out of it. On the guide, you enter the of type of material you are working with and what medium it is going on and it tells you the temperature and time needed. Then you set your machine and the cute little bug light will turn green when it is ready. I also love that after 10 minutes of idle time it will start to beep and then it will turn off for safety! If you are still working when you hear the beep you can just press any button and it stays on. The EasyPress comes in 3 different sizes which is convenient for different types of projects. I have the petite and the jumbo (this is the jumbo pictured above). The jumbo is 12″x10″ and I love it! I have made shirts, pillows, bags etc. with this one. There is a mid-size that is 9″x9″ and the petite is 6″x7″. The petite one os perfect for, you guessed it… small projects; fabric scraps, onesies, hats, shoes, small quilt pieces etc. The two shirt files that I used are part of a shirt collection from House that Lars Built. There are quite a few more so be sure to browse around! You can find the ones I used HERE and HERE. Once you open your file in the Cricut Design Space software, you can customize it. You can change colors, size, layout etc. I was making one of these for my daughter so I made her design a little smaller. I always cut my vinyl beforehand to make sure I don’t waste any vinyl. When you choose “make it” on the software it will show you exactly where the design is on the cutting mat and you can move it around and that is how you will know what size to cut your vinyl and you where to place it. With heatpress or iron-on vinyl there is a shiny side and a matte side. The shiny side is the “top” and that will be the side with the carrier sheet to help you later when you press it with the EasyPress. You always cut heatpress vinyl with the shiny side down to protect that carrier sheet and keep it intact. After you cut your vinyl to the correct size, place it shiny side down on your cutting mat. Now we are ready to cut our design! Remember we placed the “top” or the shiny side down so we want to make sure to mirror our image. After your design is cut you will weed it. This means removing all of the negative parts of the design. You will do these same steps with each design. Don’t let a design with multiple colors scare you! You take the same steps, just cut each color one by one and weed each layer. Now it’s time to press the design with the EasyPress! I looked up the settings on the EasyPress Guide for the vinyl I was using and for this specific shirt so I set my settings to 315 degrees for 30 seconds based on their recommendation. It also told me to preheat my shirt for 5 seconds before pressing the design on. For a design with multiple colors, you do the exact same thing… just start with the bottom color and work your way up. I started with the blush vinyl, then did the blue then lastly, the red. I LOVE LOVE LOVE how these turned out! Bee and I love coordinating outfits and I am so excited to wear these! Overall I’m super impressed with the Cricut EasyPress 2, I can tell that I will be using it a ton in the near future! Please let me know if you have any other questions about this machine that I didn’t answer! Happy Crafting! Love this cold shoulder dress for toddlers! Bee has worn it a few times, I love that it can be dressy or casual. Bee wore this on her birthday… the quality is great… and I can’t handle the cuteness! Bee also has both of these… you know I can’t resist a good floral dress. There are precious buttons on the back too. And the copper pinafore… I can’t. We even have an oversized blow that matches perfectly, could be a first day of school outfit? Give me all the pinafores! All of them. The first two only go up to a size 3 and 4. Sadly Bee can’t order those so someone is going to have to do it for her haha! Bee has these dresses in other patterns from this same company. They have held up perfectly but Bee needs a longer size so she clearly needs more. I am going to try out these skirts. They have shorties built into them which is just about the best invention EVER. The bug skirt might be the cutest skirt I’ve seen. Love love love these. Bee has the brown ones and there are perfect for winter in Texas. $12 for six sets.. amazing! Speaking of winter… it might be a few months away but I should probably stock up on a few of these too. I love the dinosaur option for girls… sisters of brothers everywhere rejoice!